Did you know we have an option to help patients in Kansas City, MO, enjoy a full smile in just one visit? 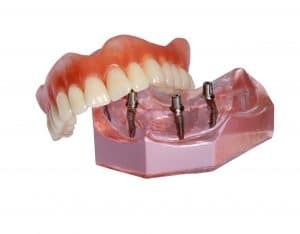 With implant dentistry, we offer lifelike and durable dentures, often in the same visit. Let’s talk about the benefits of addressing your tooth loss, and how we use dental implants to secure a new smile. Typically, we begin by choosing the placement area and then inserting one or more dental implants. Afterward, we don’t move forward with the restoration placement until osseintegration occurs. This process enables the jawbone and dental implant to bond, just as a tooth root would, ensuring a stable and long-lasting replacement tooth. After three to four months, we design and create a dental crown or prosthetic, and attach it to the dental implant, completing your new tooth. For some patients with multiple missing teeth, we may insert more than one dental implant and then attach a prosthetic in the same visit. When leaving the office, you leave with a full smile. Once your permanent prosthetic is ready, we remove the temporary one and add it, ensuring you don’t have to navigate your day-to-day life with gaps in your smile or without teeth. We take a number of factors into consideration before suggesting same day implant dentistry, such as the patient’s medical history, the strength of the jawbone tissue, and whether or not advanced gum disease is present. Don’t live with tooth loss. The issue is much more than just a cosmetic concern. When you lose one or more of your teeth, your body will stop supplying the jawbone around your lost teeth with key nutrients. Soon, the nutrient-starved bone tissue deteriorates, leading to further tooth loss and in some cases, a much older appearance. Other factors related to tooth loss include a higher risk of TMJ disorder and bruxism, as the lack of teeth may place pressure on the jaw joints. Since misalignment often develops as gaps occur in the smile, the risk of tooth decay and gum disease may rise as well. If you have one or more missing teeth, then talk to our team. We will perform a thorough diagnosis and talk to you about your concerns before recommending implant dentistry. From there, we will help you achieve a full and beautiful smile, often in the same day. Don’t let tooth loss hinder the health and beauty of your smile. Our team offers a solution to missing teeth, even for those missing most or all of their smile. To learn more about oral surgery and tooth replacement, then schedule a consultation by calling Cosmetic & Implant Dentistry of Kansas City, MO, today at 816-897-4288.